We create custom registration sights for you event. They are amazingly simple, so you can include all of the details that event attendees will need to know. 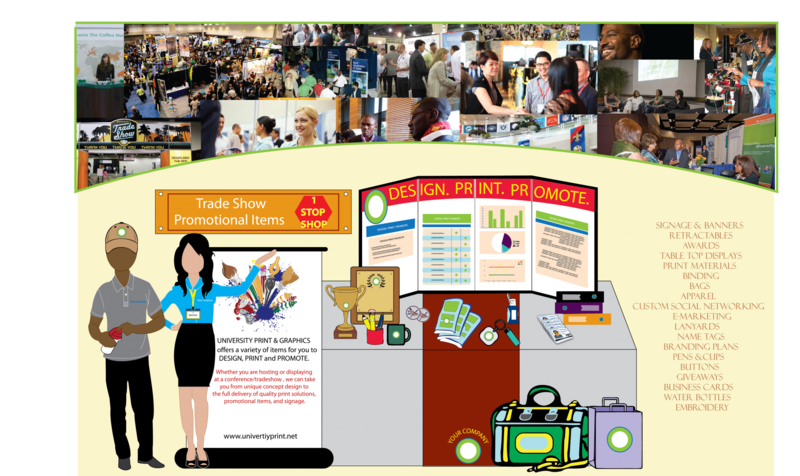 Impress your attendees with custom conference badges and branded lanyards. By utilizing the finest quality materials available and adding hands on craftsmanship we are able to produce a nice quality product for you, which is accompanied by a 24 hour turn around on standard orders. Whether it is engraved or digitally printed, we look forward to helping you with all your name badge and tag needs. We are committed to designing and crafting innovative awards. There are countless ways to customize your award from UPG. Incorporating your symbols, icons and colors truly make the award a special keepsake that reflects the foundation of your organization and communicates your goals. We have a wide selection of our unique ring and award styles that have been customized and manufactured exclusively for clients by UPG. We’d love to symbolize your company’s legacy next. No other company has the unique ability to offer an end-to-end solution for all of your decorated apparel needs. From award-winning embroidery to screen printing and unique logo design options, UPG has what it takes to quickly and successfully fulfill your decorated order. Whether it’s room signs, informational displays, or directional signs, we can help you do your event signs, posters, and banners easily and affordably. Since we support all of the common programs, you can often design your event signs yourself, saving time and money. For meeting room signs that will sit on an easel, we usually produce 22×28 or 24×36 prints mounted on foamcore board. This type of event sign will easily last a day or two and is easy on the budget. Our table coverings and runners feature surged edges and drape elegantly for the perfect finishing touch to your display at any event! We offer full color with 100% coverage at no additional charge. They are priced at least 35% below comparable offerings with FREE GROUND SHIPPING! Partner with us to produce your conference materials and deliver them to your meeting location. You’ll be amazed how affordable our printing services are and how enjoyable it is to work with the UPG team. We understand how busy you truly are and we’re happy to help make your day a little easier. We are ready to help you select your promotional cups, pens, golf gifts and more. We can help you make selections from our website or from the vast array of additional items that we can tailor to your specific needs. Putting your logo or message on the promotional conference bag turns your advertisement into a moving billboard. After hours of walking at the show someone is sure to come up to you and ask where did you get that conference tote. Instant marketing.